In a not so distant past, beer was brewed with an extended and varied array of botanical ingredients. Herbs, roots and spices where used by our European ancestors in order to give their beers distinct tastes, flavours and properties. These botanicals where sometimes referred to as Gruit, hence Gruit Ale. Today however, beer is almost exclusively brewed with only one, single herb addition: Hops. Hops, of course are wonderful for brewing. They have the combined qualities that few other plants have, being at the same time bitter, aromatic and antiseptic, all qualities greatly valued in a good beer. Would this explain why Hops have supplanted all other herbal alternatives? What’s interesting about beer history is when you ask Why Hops? the answer is: because of Gruit. Most beer historians seem satisfied with the general idea that at one point in history, brewers finally discovered once in for all that Hops was the perfect, unchallengeable beer herb. And all the others herbs and spices that went into Gruit simply faded into oblivion, unable to compete with the multifunctional and delicious Hops. Simple and partly true, this explanation unfortunately doesn’t answer the full question, and fortunately for us, answering the full question opens a whole new world of creative brewing possibilities.And that is what this site is all about. This web site is dedicated to Gruit Ale, to what it was in a historical sense, and to what it is (and can become) today in modern craft brewing. On a historical level,Stephen Harrod Buhner wrote an excellent piece on the religious and mercantile backgrounds in which Gruit flourished for more than 700 years, and was then fought and prohibited in many regions of Europe. Dave Bonta also wrote a great article which gives a whole new perspective on Gruit, Hops, and brewing in general. On a pratical level, you’ll find herein a growing repertoire of brewing botanicals, as well as Gruit Ale and Unhopped Beer recipes. I’m the first to admit the site is incomplete but rest assured, more content will be added in the weeks and months to come. 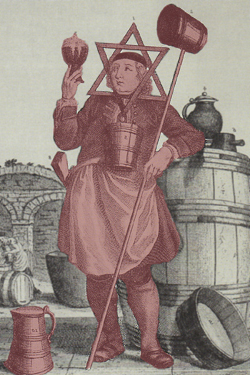 I hope above all that gruitale.com helps anyone interested in beer and beer history to explore the renewed, rich and delicious possibilities of Gruit Ale. Welcome to the Gruit Ale Revival.